A strong body of research shows that high-quality early childcare and preschool programs substantially improve low-income children’s education, health, economic and life outcomes, as well as reduce the use of social services.1 Many of these beneficial effects show up in the relatively short-term, while others continue to emerge over time. Unfortunately, not all early care is high-quality, and many low-income children lack access to high-quality programs. 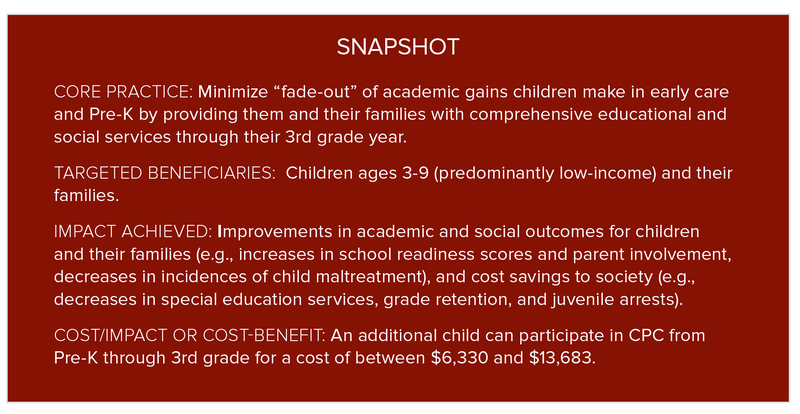 Some research also suggests that academic gains from participation in early care may dissipate by later childhood, once children are in school.2 Possible explanations for this “fade-out” effect include: a) the programs studied were in fact of mixed quality, and could be stronger academically; and/or b) where children transition from Pre-K programs into poor quality elementary schools, lack of continued and articulated support for early learning at school and at home leads to loss of skills. The hub of the program is the CPC itself, a physical space that hosts Pre-K and kindergarten classes and maintains a staffed Parent Resource room. In each CPC, a Head Teacher leads the program and coordinates delivery of a curriculum covering literacy, math, science, and socio-emotional development. From 1st through 3rd grades, CPC students matriculate into the program’s partner elementary schools, but they maintain smaller class sizes and retain additional support. The Head Teacher works with a School Facilitator to ensure there is continuity in the delivery of the curricula and support services to students through their 3rd grade year. All staff that work with the CPC’s students receive on-going professional development aimed at improving student outcomes. Parents are deeply engaged in the program. They work with CPC staff to develop an involvement plan and calendar, and they commit to regular conferences to monitor their children’s (and their own) progress. Parents also actively participate in Parent Resource programming such as health and nutrition services, medical screenings, school events, and classes in parenting and other life skills. CPC students were assessed against a comparison group using the TS GOLD, a commonly used assessment of school readiness, which is divided into six subscales of school readiness characteristics. The total score of CPC students on all six subscales surpassed the comparison group by 27 points (286 vs. 259 in overall score). 69% of these CPC students scored at or above the national average on four or more of the subscales, compared to only 52% of the comparison group. Scoring close to the national mean is notable since low-income students generally score lower on measures of school readiness than their peers from middle and high-income families. CPC participants also had higher rates of parent involvement as rated by teachers. Benefits to parents and caregivers: The CPC approach of deep family engagement is designed to go beyond the enrolled student. Indeed, enhancing educational attainment, career prospects, and personal development for parents is an explicit goal of the program. Services delivered through the Parent Resource room, such as professional development, nutrition and health classes, and parenting workshops, benefit parents and other family members as well. The annual cost per pupil of implementing a CPC Pre-K program is approximately $1,950, which is an additional cost on top of the annual per pupil expenditure of each elementary school partner for Pre-K education services. The $1,950 per pupil covers the cost of a CPC leadership team, ongoing professional development and coaching for teachers, parent/caregiver mentoring, and progress monitoring. This annual expense is funded by a mix of public grant funding, such as the i3, contributions from schools and school districts, and private philanthropic support. The annual cost per pupil of implementing CPC’s K through 3rd grade programming is approximately $1,100, which is also an additional cost on top of the annual per pupil spending of the elementary school partner. These funds provide for a reduction in class sizes to 25 students per 2 adults maximum, and allow CPC staff to continue to coach teachers and offer parent/caregiver mentoring. 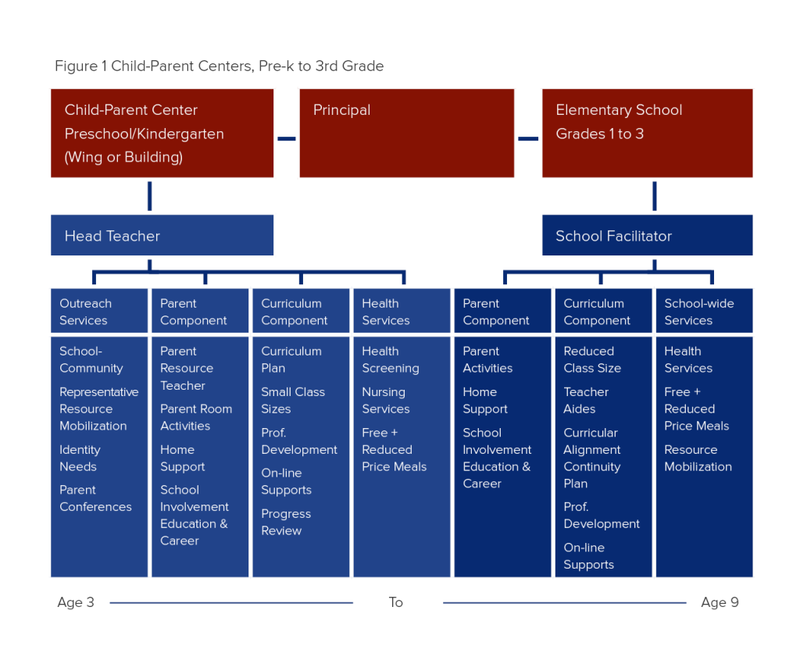 There can be start-up costs associated with the CPC program depending largely on the elementary school partner, which serves as the program’s site. If the elementary school partner has an existing, full-day Pre-K program, conversion to the CPC Pre-K model involves no start-up costs. If the elementary school partner has only a part-day or no Pre-K program in place, initial costs can range from about $3,600 to $7,400 per pupil. This additional cost is incurred by the school partner, who typically applies for public Pre-K subsidies and public education funding grants from local, state and federal government agencies. An additional child can participate in CPC for five years (Pre-K through 3rd grade) for a cost of between $6,330 and $13,683. The high range reflects start-up costs where CPCs partnered with elementary schools that did not previously offer Pre-K to students. Improved academic and social outcomes for children and their families: Compared to peer groups, CPC students are better prepared for kindergarten, more likely to achieve academically, more likely to graduate high school, and less likely to experience maltreatment. Societal cost savings: Compared to peer groups, students who participate in CPC programming are less likely to need special education services or grade retention, which considerably reduces the cost of educating these students. For example, in 2013 dollars, the average cost of special education per child per year in Chicago is $15,622 above and beyond the cost of regular instruction. viii CPC students are also less likely to be arrested for violent crimes, which generates savings for the criminal justice system. Take Action: Visit the Child-Parent Center Preschool to 3rd Grade (CPC P-3) for more information about the Midwest expansion of the CPC model, to review the latest results, or to contact CPC staff. 1 Two notable examples are the Abecedarian project and the Perry preschool project. Note: The social impact bond will support the expansion of part-day preschool programs for 2600 students, and evidence of the effectiveness of part-day care on students’ school readiness was not as strong as that of full-day programs according to CPC reports. For more on social impact bonds, see our funder brief Patching the Quilt: Early Childhood Policy and Finance for Donors. 5 Reynolds, A.J., Richardson, B., Hayakawa, C.M., Lease, E.M., Warner-Richter, M., Englund, M.M., Sullivan, M. (2014) Early childhood intervention, school readiness, and parenting Human Capital Research Collaborative, University of Minnesota. 6 Reynolds, A.J., Richardson, B., Hayakawa, C.M., Lease, E.M., Warner-Richter, M., Englund, M.M…Sullivan, M. (2011) Early childhood intervention, school readiness, and parenting Human Capital Research Collaborative, University of Minnesota.